Knowledge about prison survival strategies can serve as your guide in surviving prison or getting yourself ready to go to prison if you have been incarcerated for whatever reason. These strategies can help you stay safe while knowing exactly the prison etiquette, the proper ways to deal with the guards and the other inmates and handling the process of organizing yourself even if you are already imprisoned and prevent yourself from struggling. A guide in surviving prison is one of the many things that prisoners should get as this will work in providing unique insights regarding the problems and needs of convicts. If you are an offender, then it is greatly possible that there will be hundreds of questions that will come rushing through your mind after the legal proceedings so you have to make sure that you mentally prepare yourself for your sentence. The good thing about this is that you can enroll in a prison survival strategies certification course to help you gain a complete understanding about the many things that you can do to make your life in prison a bit easier. If you are not a prisoner but you wish to help inmates understand the culture and environment at prison to give them an easier time adjusting, then the prison survival course can also do you a lot of good. 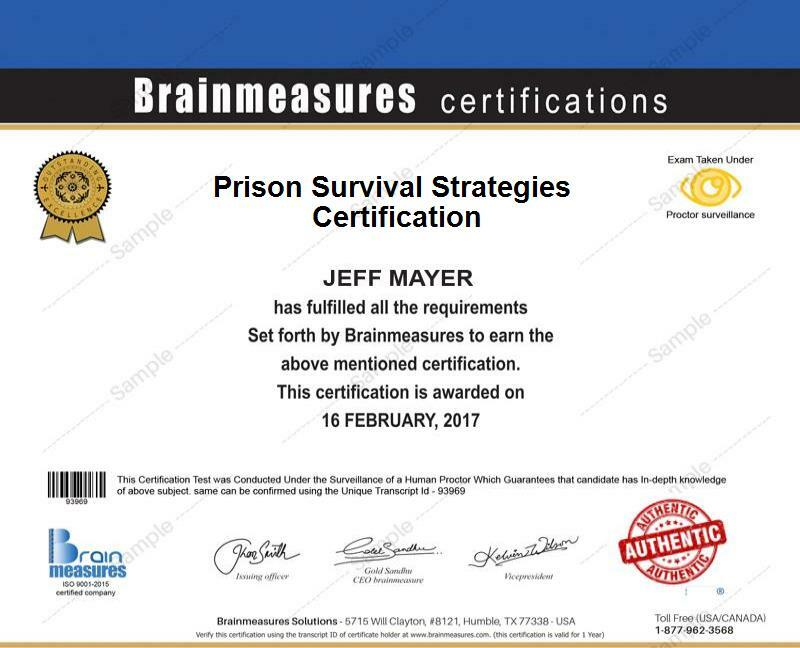 If you want to take up a prison survival strategies certification course, then know that Brainmeasures is capable of offering you this type of course. Brainmeasures is leading in the field of providing the best online certification programs and employment testing to people worldwide and it has been proven that the company is capable of giving you the most informative certification courses. With the help of the prison survival strategies certification course from Brainmeasures, you get the chance to improve your prison survival skills while also learning the basics of properly imparting your knowledge and skills in surviving prison to the inmates. The certification course also comes with its own prison survival strategies test which aims to assess your skills in handling everything related to prison. Passing the test is an indication that you already have the ability to easily adapt to the environment in prison and teach inmates on how they should act once they stepped within the portals of their prison cells. If you are the one who is convicted, then earning your prison survival strategies certificate can definitely help you in making your life a bit easier. The prison survival strategies certification program greatly benefits anyone who is convicted for a legal reason and who finds it hard to prepare himself to go to prison and adjust in the new environment. The certification program is a major help in allowing anyone to fully understand the daily activities of prisoners and make the idea of staying in his prison cell bearable. The certification program is also designed for individuals who wish to be a huge help to prisoners who are still on their adjustment period. This means that you can enroll in the program even if you are not a convict so you can start teaching the inmates about the culture in prison and guide them towards living a more bearable life once they are incarcerated. Because of the hundreds of people who need advises on how they can deal with their lives after being convicted, it is greatly possible for you to earn a decent sum of money after you receive your prison survival strategies certification. Being an expert in prison survival strategies can help you become a prison consultant and allows you to earn a salary which starts from $64,000 annually.